I got a speeding ticket in Brampton, Ontario! It was the afternoon of November 23, and we were on our way to visit my younger sister, Vinie, at her work. She is a 3rd grade teacher at a public school in Mississauga. We had just left the house and were barely 1/2 a mile away, when I was pulled over off a major road called Chinguacousy! Yeah, try pronouncing this street name! The officer, a nice female one, told me that I was travelling over 30km/hr past the speed limit. I told her that we had just arrived after midnight from Vermont, weren't familiar with the area, and bla bla bla. She took the usual documents, license, registration, insurance, and said she would be back. 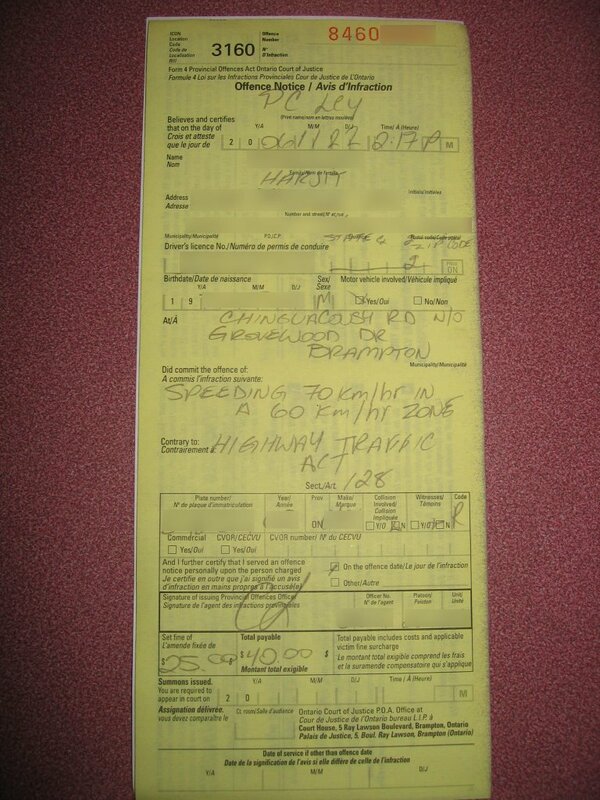 She returned 15 minutes later and apologized that she had to give me a ticket but she reduced it to 10km/hr over the limit and no deduction in points. The fine came to CDN$40.00 instead of CDN$185.00. I think she liked me! She was a pretty good looking police officer, but I didn't feel like giving her the opportunity to use the baton on me! Thank you, please come again! !